Below are small samples of the entomology prints available for purchase in-person at our gift shop. Prints are available for $20 each. If prints are not in stock an order can be placed for the print of your choice. Prints make excellent presents for nature enthusiasts and conference attendees! Orders for multiple prints can be accommodated with sufficient advance notice. 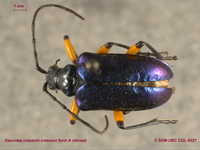 Gaurotes cressoni cressoni is a pollen-feeding longhorn beetle found in southwestern Canada. This image is a composite of several photographs captured at different focal depths to produce an image with sharp focus throughout the organism. Image capture by Don Griffiths. Post-production by Derek Tan. 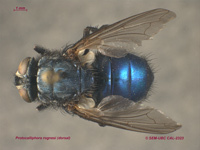 Protocalliphora rognesi is a type of blow fly, parasitic on birds in North America, Europe, and Asia.This image is a composite of several photographs captured at different focal depths to produce an image with sharp focus throughout the organism. 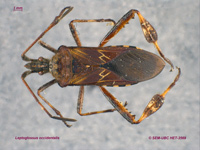 The western conifer seed bug, Leptoglossus occidentalis, is native to the Pacific coast of North America, but its range is increasing.This image is a composite of several photographs captured at different focal depths to produce an image with sharp focus throughout the organism. 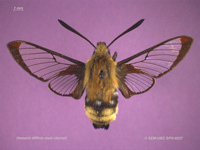 Hemaris diffinis is a type of hummingbird moth commonly known as the snowberry clearwing. It’s found in western Canada and throughout the United States.This image is a composite of several photographs captured at different focal depths to produce an image with sharp focus throughout the organism. 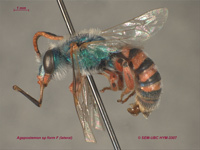 Commonly called sweat bees, the genus Agapostemon has representatives from Canada to Argentina.This image is a composite of several photographs captured at different focal depths to produce an image with sharp focus throughout the organism.